In April 1928 the foundation stone of Broadwey Methodist Church was laid by Mr JE Gray. For a time in the 1930's St Nicholas Church did not hold a Sunday school and rather than making the journey to Upwey Church, many joined in with the Methodist Sunday School. The room at the rear was used by many groups and clubs over the years. In 1973 Jan James was given permission to base her playgroup here, having previously been at the Reynolds Institute. 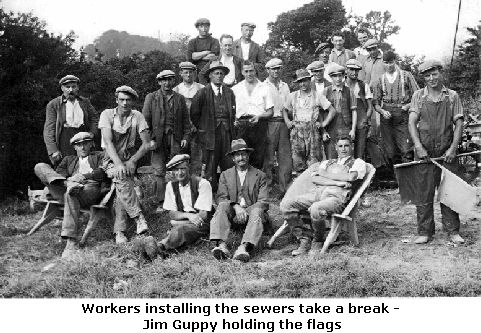 Roadworks were a common sight during the 1920's and 1930's, as the Weymouth Consumer Gas Company were making their way through Upwey and Broadwey to make gas available to residents in both villages, which could be used for both lighting and cooking. A gasometer (storage tank) was built at The Grove; in the early 1960s 'natural gas', also known as 'North Sea gas', replaced coal gas. So gasometers and their associated gas works became redundant. Over time they were largely taken down and sold for scrap. In August 1928 electricity was making its way through the village. It was reported that good progress had been made in the last week with cabling for electric light. Trenches for the huge high tension cables were being made, both in the main thoroughfare of Broadwey and some side roads. A major change to the administration of the village occurred on 1 April 1933 when the Dorsetshire Review Order came into force. This meant that Upwey, Broadwey and Preston became part of the Borough of Weymouth. There were very mixed feelings in the villages, with many people worrying that village identity would be lost. The results of the first elections of the new Weymouth Borough Council in November 1933 were announced to a large crowd at Broadwey School. Of the 1560 electors in Upwey and Broadwey, 1310 (84%) voted and elected J A Pridham, P Lovell and D Hinchcliffe to represent them. The roads were to be dug up again as under the 1933 Review Order Weymouth Borough Council had to make arrangements for the construction of a sewerage system in the three villages within five years. In the 1930's and 1940'sHarry Marsh, a local builder, was very busy building a variety of homes and business premises including a development of bungalows at Wey View Crescent, semi-detached houses at Nottington Corner; the garage at Gray's Corner and the fish and chip shop. By 1959 the first phase of the St Julien housing estate had been built; in the mid 1960's the council adopted Jesty's Avenue and Beech Road. Trees which had lined these roads were cut down to make way for pavements and tarmac roads. In 1977 barns at Lorton Farm (Crown Dairy) were sold and converted into four dwellings. A major road widening scheme began in 1976 with the section of road from Nottington Corner to the Littlemoor Road junction. The second phase from the Littlemoor Road junction to Old Station Road was completed in 1986. The overall scheme was very complex for its size. Negotiations with 100's of land owners took several years and great care was taken to replace walls and boundaries with the appropriate materials - natural stone and matching brickwork. Part of cemetery was removed at the Littlemoor junction to improve visibility - this was a specialist job as graves were moved. Hoardings were erected to screen the work from the public, including those travelling past on the top deck of buses. Before the road widening and footpath improvements, the footpath ended at junction with Springfield Road and started again just south of Lorton Lane. There was a footpath on Lorton Farm/Swan side of the road. 'Lollipop' lady Mrs Appleyard at The Swan was replaced with a zebra crossing, which later became a pelican crossing. 'Lollipop' lady Mrs Frost who worked just above the entrance to The Grove, crossing to the footpath on the other side of road. Once road improvements were carried out a pelican was installed outside Wey Valley School and Mrs Frost retired. 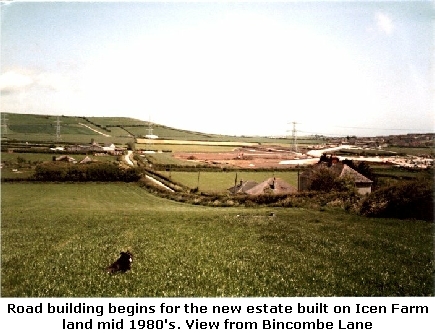 Planning permission for a large housing estate on Icen Farm and Thornhill Dairy in Littlemoor Road took several years to gain approval in the early 1980's. 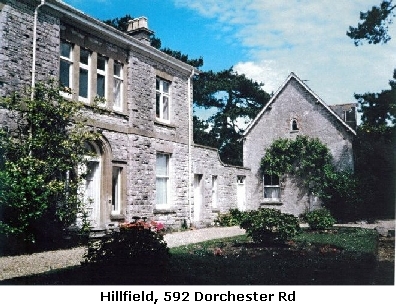 The Doctors house and consulting rooms were at Hillfield, 592 Dorchester Road from approx 1889 until 2000. From 1900 to 1920 Dr Hawkins travelled around in a pony and trap; 1920 to 1945 Dr Pridham, Snr; 1945 to 1954 Dr Pridham (son) after the war with Dr Sloan who was a partner until the 1970's. He also had his own surgery at Preston. From 1954 to 1961 Dr Peck followed by Dr O'Callaghan until 1962 when Dr Angus and Dr Jean Robinson arrived. In 1995 the surgery and receptionists moved to the brand new Health Centre at Littlemoor, although Hillfield was used for some appointments until Dr Jean retired in 2000. The waiting room was in part of the coach house with coir matting, an assortment of chairs around the sides of the room, a large table in centre covered in magazines. At the 'open' surgery, when you went in you tried to count how many people were there so you'd know when it was your turn. There were various posters on wall including one of poisonous plants. A gas fire 'popped' at one end, cold at the other nearer the door. A buzzer sounded when Doctor ready for next patient. You could s ee the last patient leave the surgery through the window and be ready for the buzzer to go - but it still always made you jump. Before the introduction of the NHS in 1948, the village nurse/midwife was often the first port of call as the Doctor charged a fee for consultation. Funds were raised for local Nursing Associations through events such as dances at the WI Hut. In the 1920's the village nurse was Mrs Jolliffe, who lived in cottages near Mason's Arms, wore navy blue and carried a little black bag. Mrs King (Church St) and Mrs Jarratt (Victoria Ave) were midwives. In the 1930's Nurse Curtis lived in Stottingway Street until 1937 when she moved to a newly built bungalow in Weyview Crescent. She was often to be seen pedalling around on her bicycle. Nurse Curtis was well liked and known to be strict and efficient. 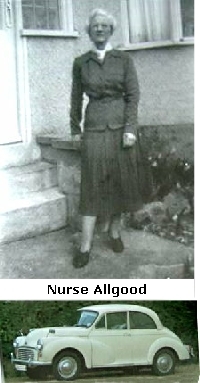 By the 1950's Nurse Allgood , was one of three Health Visitors based at Westham Clinic in Weymouth. They did duty at the clinic; including antenatal talks and issuing baby food/orange juice. She visited expectant and new mums in their homes in the Upwey, Broadwey and Preston areas and carried out school visits (fondly known as the 'nit nurse' by the children) travelling around in her white Morris Minor. Nurse Allgood retired pprox. 1964 and passed away in 1977, being almost 80 years old. In the 1970's Miss Stembridge was Health Visitor, visiting and taking baby clinics at both Reynolds Institute and the Upwey & Broadwey Memorial Hall. Rogers Dairy Farm wa s situated in Icen Lane. 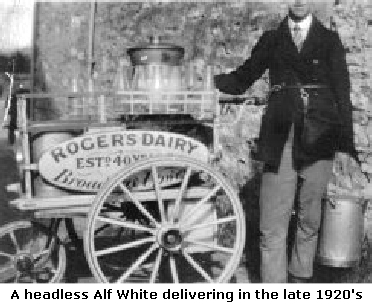 In the mid 1920's Ray Rogers decided to expand his milk deliveries to a wider area. Mr White was working for him at the time and he would set out each day with a yoke and two buckets of milk canvassing for sales in the Littlemoor area. In addition to delivered milk, people went to the dairy to buy milk and buttermilk. Ray Rogers then decided to open a shop in part of 74 Jesty's Avenue. During the war women took the jobs as the men went to war. Rogers had one van but petrol rationing meant that a motorcycle with a churn of milk in the sidecar was more economical. Margaret White, who started work there in about 1940, used a tricycle to deliver the dairy's produce in the local area. This tricycle was later sold to Percy Dominey of Church Street, who used it to take his watercress to the station. Butter production in the dairy was stopped in the war due to food rationing - the butter came in blocks which had to be cut into 2oz portions as did solid cooking fat. Rogers were taken over by South Western Dairies, then Lovells (keeping the trading name of Rogers Dairies) and finally Unigate about 1975. Sometime between 1972/4 when Cyril Preston was manager of Rogers Dairies (he and his wife lived upstairs, the shop and offices being downstairs. One evening Cyril had just received all the drivers back in the yard and went into the office to put the cash brought in by the drivers into the safe for the night. There was a knock at the yard door, on opening it Cyril found three men standing there. They asked if they could buy some milk. Cyril went to go into the shop to get it but they followed him shutting the yard door behind them. They grabbed him and demanded the keys to the safe, Cyril refused and a fight ensued, during which he was hit on the head with a metal object and sustained a fractured skull. His wife on hearing the noise came rushing down the stairs and went to her husband's aid. She also sustained a fractured skull, but managed to escape and rushed next door for help, from where police and ambulance were called. They left the dairy and sadly Cyril died about two years later aged just 67yrs. The shop closed in March 1980 with permission being granted for use as storage/residential. In 1998 permission was granted for the conversion of the Edwardian house/shop into new home with flat and garage. 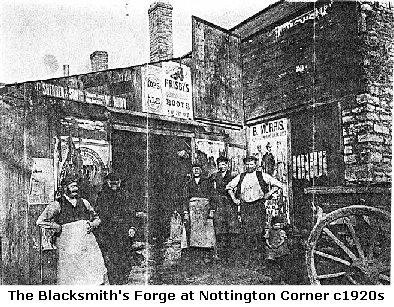 The Blacksmith's Forge a t Nottington Corner By Tony Cake (Grandson of Henry Stickland) written Sept 2005). Henry George and Charlotte Stickland were my Grandparents, my mother Phyllis was the third daughter. Henry was sent away to Piddletrenthide to take his apprenticeship as a wheelwright with a blacksmith/wheelwright called Mr Hunt. He lodged with Mr Hunt and family. Grandpa's actual apprenticeship was as a wheelwright and he always said he "picked up blacksmithing as he went along" ! However he learnt it, he was known as a fine shoeing smith and people brought horses from afar to be shod by him. Henry George Stickland bachelor age 29 married Charlotte Legg a spinster age 32 at Piddletrenthide church on 16th. 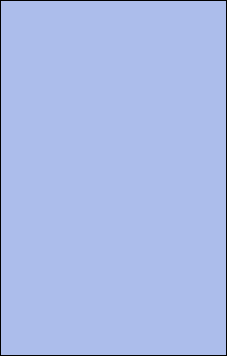 October 1901. Henry and Charlotte moved into Forge Cottage (adjoining The Elms) on the day they were married, driving from Piddletrenthide in a pony and trap. They later moved into "The Elms" house after Mr Winzar moved out and stayed there until their deaths in 1945 and 1947 respectively. Grandpa took over the existing blacksmith business from the Winzar family and worked the forge continuously until the morning of his death in 1945, from a massive stroke from which he never regained consciousness. The forge is thought to be quite old and was much bigger than the usual forge, grandpa only used one forge but I recall the remains of two other forges in the same building - must have been more like a factory at some time in the past!! There was also a giant hand powered lathe for turning wood wheel hubs, power was from a great wheel about 6 feet high with a handle each side needing two men for power. Grandpa made his own cider and as a small boy I watched the cider press in action it was situated at the far end of the carpenters shop. During the first world war grandpa taught groups of soldiers "cold shoeing" so that they could quickly shoe the many horses used by the Army. There was always a separate "carpenters shop" in the lean to adjoining the main building. From at least the late 1930's Frank Burgess was the carpenter/wheelwright who worked with grandpa. After grandpa's death the forge was rented out to another blacksmith, Mr Aplin, I don't think he stayed very long, moving to the forge at the bottom of Ridgeway. Grandpa had a one acre plot of land (known as Morris Orchard) between Springfield Road and the Old Rectory, where he had an orchard, vegetable garden and kept poultry. After my grandparents' deaths my Aunts Ethel and Marjory remained at The Elms until they died in 1967 and 1972 respectively. The property was sold in 1974 and since then a new house has been built in the garden of The Elms. The blacksmiths shop was sold in 1983/4 and demolished to build another house. 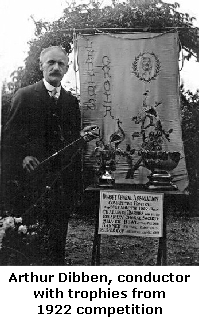 The Reynolds M emorial Institute provided in accordance with the bequest of Mr Frank Reynolds for the men of Broadwey, was opened on 13 May 1933 by the Mayor of Weymouth Captain FW Hamblin. 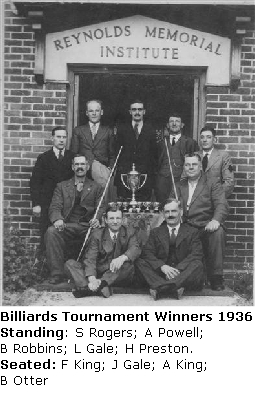 Mr Frank Reynolds who died in 1930, left £2000 for the provision of the institute comprising of a billiards room with two full size tables; a games room and kitchen. In connection with the provision of the institute Mr Reynolds appointed an Advisory Committee of which Mr AH Edwards of Dorchester was president and chairman. Members of the committee were: OJ Gale; L Gale; A King; F King; C Murray; H Preston and W Tatchell. There were 3 conditions attached to the hall. Firstly no intoxicants were to be brought into, or sold in the hall; secondly it is never to be used for political meetings and lastly gambling is not to be allowed on the premises. Mr Jarvis was elected to the office of steward. The Institute was very popular and was used as additional accommodation for the school, a baby health clinic and in later years as a polling station. In March 1950 over 30 youths aged 12+ from Upwey, Broadwey and Radipole met at Reynolds Institute in response to request by Norman Strange to discuss forming a club. It was agreed the club should have 2 sections to promote competition. Charlie Langridge and Tony Taylor elected as 2 leaders. Broadwey Veterans Club. On Tuesday 6 March 1951, a meeting was held at 3pm at 20 Old Station Road, Broadwey (the home of the Medlam family) to discuss the possibility of the formation of a Veterans' Club in the Broadwey District. It was to be established to give pleasure and be of real benefit to many of the older residents. There were no specific rules made, except the very important ones that the Club should be: Completely non-Sectarian; Non political; Self Supporting; Qualifying age for membership to be 70 years. On Thursday 19 April 1951 Broadwey Veterans' Club was opened at the Reynolds Institute by the Mayor of Weymouth, Alderman HA Medlam, JP. Twenty-six people enrolled that afternoon which was considered very satisfactory. The club continued for many years, with members enjoying fortnightly meetings, outings to places of interest in the summer months, Christmas Parties and trips to the Pantomime in the winter. From 1987 monthly meetings included Bingo and Whist. In 1993 Weymouth Round Table chose the Club as one of the beneficiaries from Weymouth Carnival 1993, donating £200 which was presented at Hotel Prince Regent on Mon 22 November 1993. In later years they met at The Swan until it was closed at the end of 2004. The Club also decided to close and held their last meeting in November 2004, organiser at that time Mr Martin, Jestys Ave.
Broadwey Ch oral Society was founded 9 February 1920 by a handful of musical enthusiasts, including Rev Walder, Mr Barnes, Mr Dibben and Miss Audrey Walder. The first concert was held at Broadwey Church. In first year there were 16 ladies and 10 men. In 1922 they achieved great success at the Dorset Choral Association Competitive Festival held at Weymouth. The full choir won the Baxter Silver Bowl for the second year. The men won the Holwell Silver Cup (for large villages) and the ladies the Gadesden Banner (for towns). J Tewkesbury;Ms Walton; Mrs Wellman. In December 1952 Mr AL Flay of Weymouth Singers was invited to take over as musical director of the society which rehearsed in the primary school. 1955 - Broadwey Choral Society merged with The Weymouth Singers.